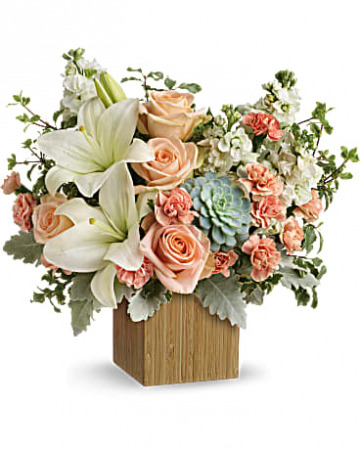 Reminiscent of a desert sunrise, this modern mix of peach blooms, white lilies and succulents is a super chic statement in a natural bamboo cube. 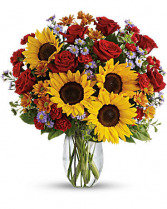 Peach roses, white asiatic lilies, peach miniature carnations, and white stock are accented with pitta negra, dusty miller, and a green echeveria succulent. 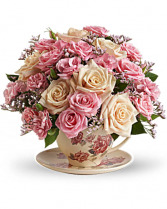 "Send warm wishes with this lovely gift bouquet that arrives in a ceramic teacup. 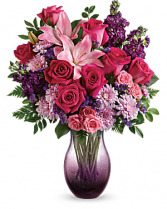 This charming, old-fashioned bouquet features pink roses,Pink mini carnations, white babies breath and luscious greenery.